Having a web site published on the world wide web (aka: internet) doesn't mean visitors will automatically flock to it. Even the most well-designed web site will experience minimal viewership without clever search marketing. All our sites are created "optimized" . That means that from the start they are clean and easily "crawled" by the search engines. If you have an existing site, you may not realize that there are issues with it that are preventing it from being crawled by the search engines. As a result search engines may visit your site but immediately determine that it's not worth reporting in their search results. 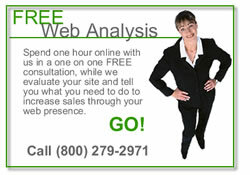 Complimentary Website Analysis - Spend up to one hour online with us where we will evaluate your existing website for search effectiveness and viewer useability. We will determine if you have any "on page' issues that are keeping the search engines from considering you. We will also tell you what happens when a human visitor lands on your site - what they see, what they do and we will give you recommendations on how you can improve your site for search.